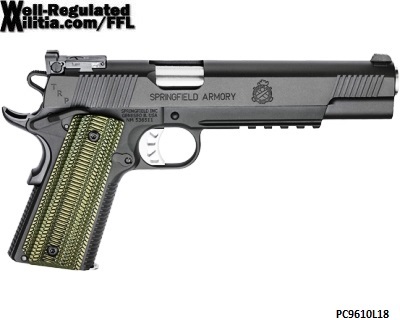 Springfield Armory’s most elite production 1911, now available in 10mm. The 10mm TRP™ Operator® model longslide has a 6-inch barrel. Octo-Grip™ front strap and mainspring housing texturing with G10 VZ Grips® assure a confident hold. Ambidextrous safety and SA Gen 2 Speed Trigger with a 4.5- to 5-pound pull deliver custom-grade feel and performance. A heavier slide/barrel combination with an optimized recoil spring properly balances the 10mm recoil. Ships with two 8-round magazines.